So they have arrived my two agricubes to test I am excited and apprehensive. 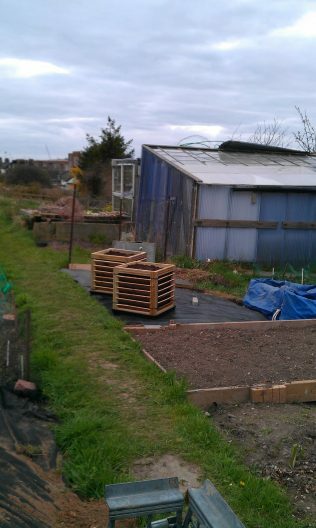 I wonder if I have bitten off more than I can chew as a first time allotmenteer. What to grow out of the huge (and unrealistic) list of I have made to try out in both the beds on my plot and the agricube. The list now is constantly being revised but on the short list are lettuces, radish, scorzonera, cabbages, sprouting broccoli, carrots, cauliflower, kale, fennel, coriander, thyme, chervil, oregano, lemon balm, pansies, cornflowers, chives, and some tomatoes (subject to change yet again). They were easier to put together than I thought and not a bad design, I was worried they’d be plastic (too much plastic in the world already) but only the bottom tray is, the rest is treated wood with slats made out of fencing material. After some work I have cleared a prime spot on the plot for the agricubes. A bed which is the worst bed of all beds, loads of dandelions, bindweed, couch grass and very uneven. I spent the day with Judy clearing the worst, skimming the grass tufts and removing dandelions then evening it out and stretching a few lengths of weed suppressant over which are now nicely firmed down by the agricubes all built and filled ready for planting. This difficult bed now has a purpose and the agricubes have a dual role. As I was there I filled two old builders dumpy with decent soil to sit on the membrane the other end and secure a tight fit, the plan is to use them for my spuds. Instead of stacking the cubes I am toying with the idea of growing on the top of the cube I decided to split them, also feels like a more efficient use of the space and ease watering problems. Now filled I was torn by which ingenious method to use for irrigation. Soaker of perforated hose not available and easy to deal with I thought I would give the competing beds a chance and use a similar method. 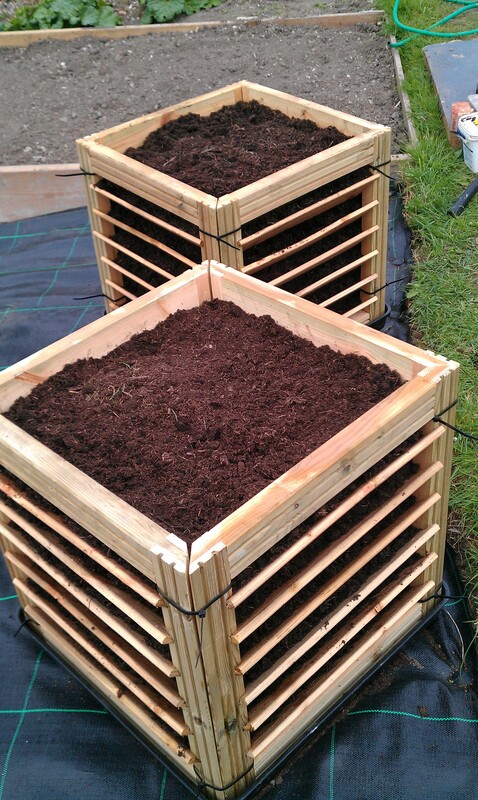 I think upside down empty plastic bottles (a few per box) with bottoms cut off embedded in top for easy and gradual watering. It’s not set in stone so if I change my mind and find a better system I will keep you all posted. So now filled and looking slightly beehive like from a distance it is getting a few curious looks from neighbours, just waiting now for the more curious person to come and ask what the hell they are. I looked back at them as I left the plot for my well earned soak in the tub and do you know…they look quite at home.